A lattice/filigree or carved wood cutout is an intricate mesh design with openings in between the framework. I found such a mirror at a local Ross store. 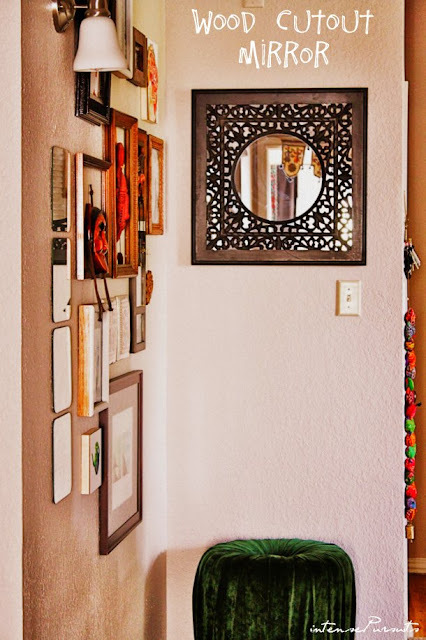 These types of mirrors are often available at ethnic boutiques or chains like World Market or Pier1. Currently they don't have any which I could share with you. But I did find some here and here. The best way to look for them is to visit stores like HomeGoods/Ross/TJMaxx often. I placed mine at the end of the corridor that leads to the bedrooms. You can catch a glimpse of my bedroom through the mirror. It is not only beautiful to look at but also the light from the bedrooms reflect through the glass and brighten up the hallway.